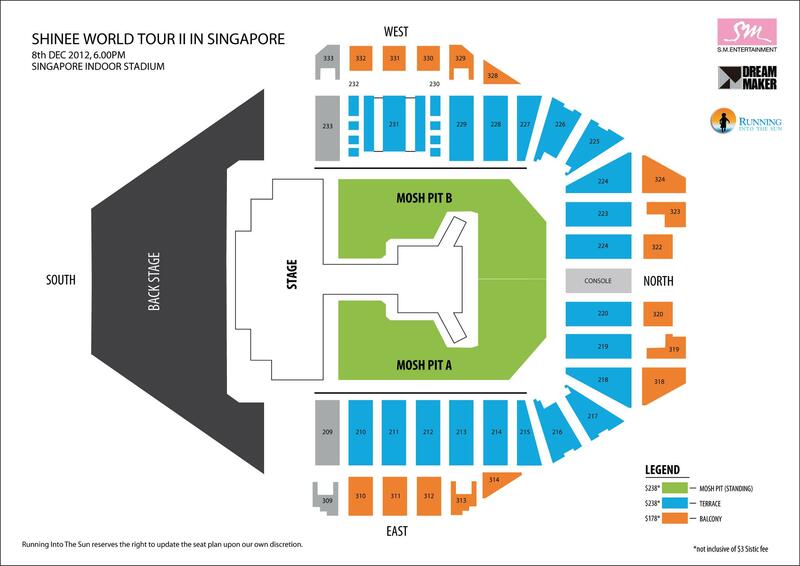 Okay, ticket information is out for the SHINee World II concert at the Singapore Indoor Stadium on 8 December 2012! The tickets are priced at $238 and $178 before the $3 Sistic fee. Tickets go on sale via all the usual Sistic sales channel at 3 pm (SG) on 31 August 2012. There is no difference in timing for Singaporean or International fans who buy via associated agents of Sistic. There is a limit of 6 tickets per transaction and there is no pre-sale whatsoever for this. Also, the organizers (Running Into The Sun) has said that this is a strictly one night only concert. Please go and read the FAQ on the Running Into The Sun official facebook page. As usual, there should be a mad rush for SHINee tickets at 3 pm on 31 August 2012 so I hope Shawols from other countries where there will be/already have a SHINee World II concert, please give other Shawols a chance to see the boys. The Singapore Indoor Stadium is not very big and with a standing/mosh pit, it can only take about 10,000 people. Finally, as per Running In The Sun’s note, DO NOT RIP OTHER SHAWOLS OFF!! You can post messages here to buy/trade/sell at the face value of the ticket price + charges OR LESS. Even if you post and delete the comment, I can see your IP address so don’t even think about it. I will gladly submit your details to Running Into The Sun if required. That said, good luck guys! Here is the link to the Sistic page to buy tickets.